After an excellent relaxing break at Ca’Savio in Italy, it was with a heavy heart that we left the campsite and headed back north. A “heavy heart” because our holiday was coming to an end, and because we knew just how far and long the journey was going to be. Though, it turned out to be even longer on the way back north! My original plans were to travel back via France, but in the end, it was a lot simpler to return the way we came. Afterall, having already been to each campsite before should make it easier, right? Not necessarily, as it turned out. The journey back from Italy was long. Fortunately, Shell managed to operate the automated toll booth better than the locals! It was later in the evening by the time we reached See Blick Toni, only this time, we weren’t staying a few days to make the most of the place. It was also clear that the summer holidays were coming to an end, with the campsite not as busy as before. This did give us a good-sized pitch. The next morning, after taking in the Austrian Alps for the last time, we headed north to the Rhine Valley in Germany. 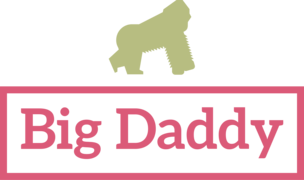 Germany – and Traffic Jams! The SatNav recommended a different route via the autobahns to avoid roadworks, which turned out to be a very long drive. I’m sure the route was about 1.5 hours longer. And there were still many roadworks along the route! Unfortunately, as we neared the Rhine Valley, a thunderstorm came in, and the heavens opened. Now you expect the traffic to slow if the rain is heavy, but what we experienced on the autobahns were cars still driving extremely fast, and then there were the resulting crashes and huge traffic jams. We spent hours just sitting there not moving forward. Now the campsite owner at Burg Lahneck is a punctual chap and doesn’t like people arriving late. We were well on course to make it to the campsite in time, but with all the crashes on the autobahn, it was clear we were going to be late. the German owner wasn’t happy! 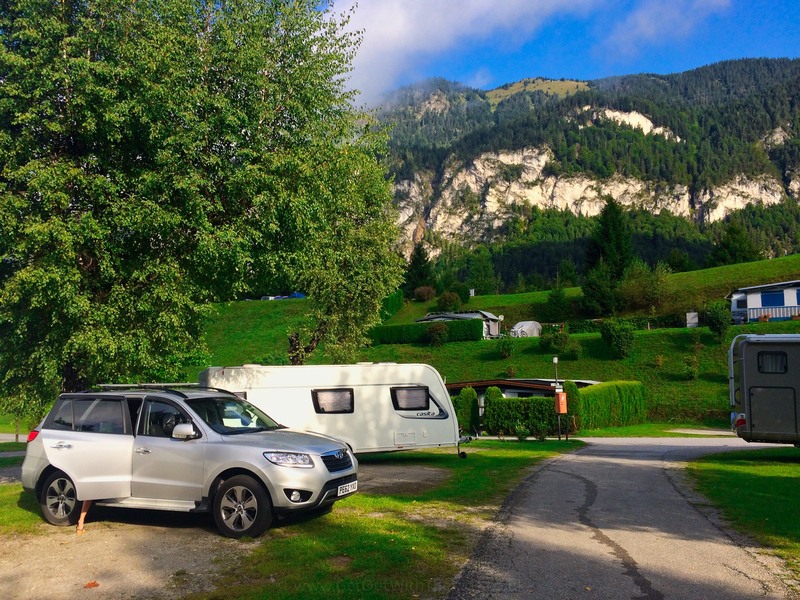 Shell gave the campsite a call, and it was clear the German owner wasn’t happy! We had 1 hour to get to the campsite, or we wouldn’t be allowed into the pre-paid pitch and we’d have to find somewhere else for the night!! 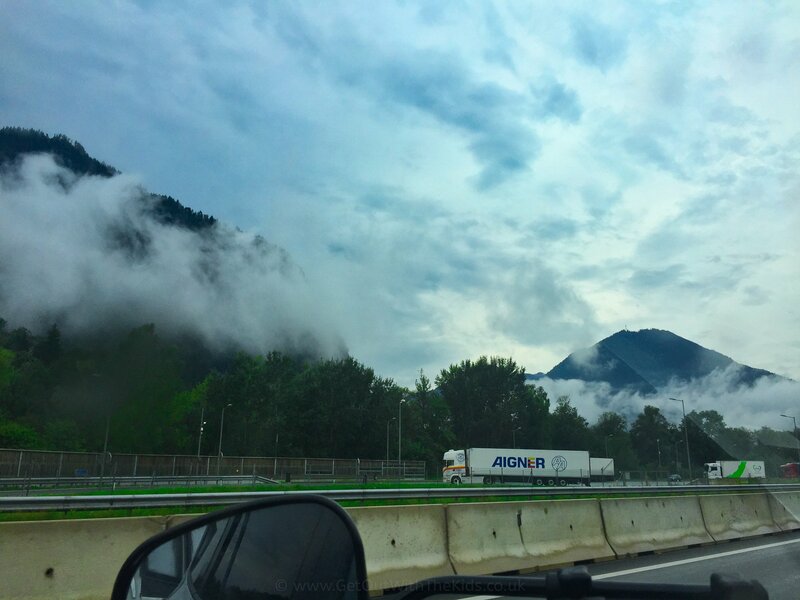 Fortunately, we started to move on the autobahn again, only for there to be another downpour of rain, and yes, you guessed it, more crashes and tailbacks. we’d have to find somewhere else for the night!! We arrived at the campsite, 5 minutes before the deadline, but the reception was closed and so we couldn’t get onto the campsite! We were stunned! Fortunately, the owner had given our details to a Dutch camper, who let us onto the site, helped us pitch, and hooked us up to the electricity. We apologised the next morning, but it appears all was forgotten, and the German owner was charming as before. 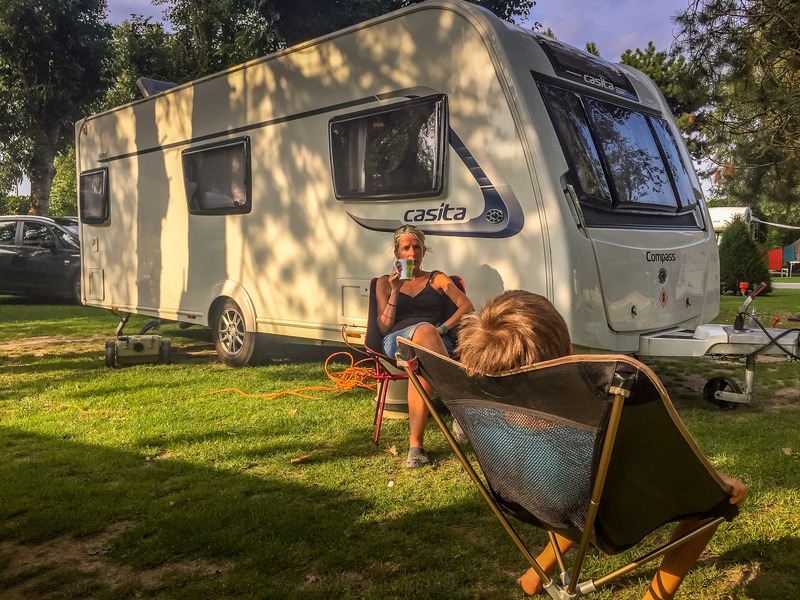 The one change on our return journey was to stay at Le Bien Assise campsite near Calais. 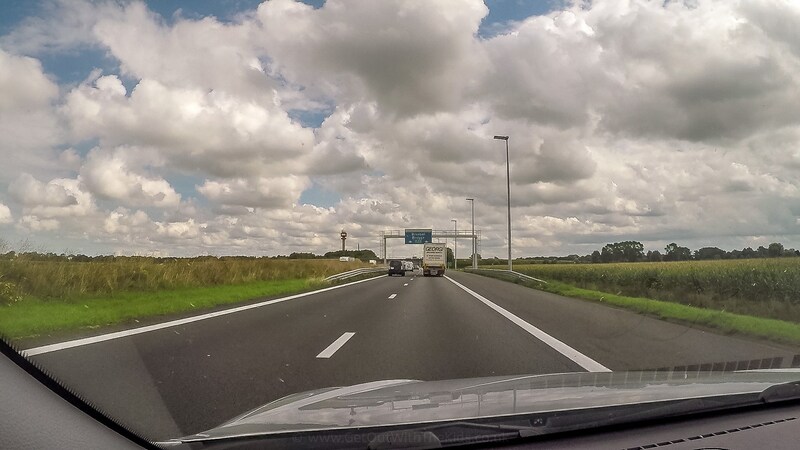 The journey from the Rhine Valley to Calais was long, and the trip through Belgium just as monotonous as before. However, despite thinking this was just a ‘layover’ campsite for the channel tunnel or ferries, it’s a charming campsite. We had a great pitch with plenty of space, despite the campsite being full. There was also a charming old farm courtyard, a place for the kids to play, as well as somewhere to eat and get a drink. 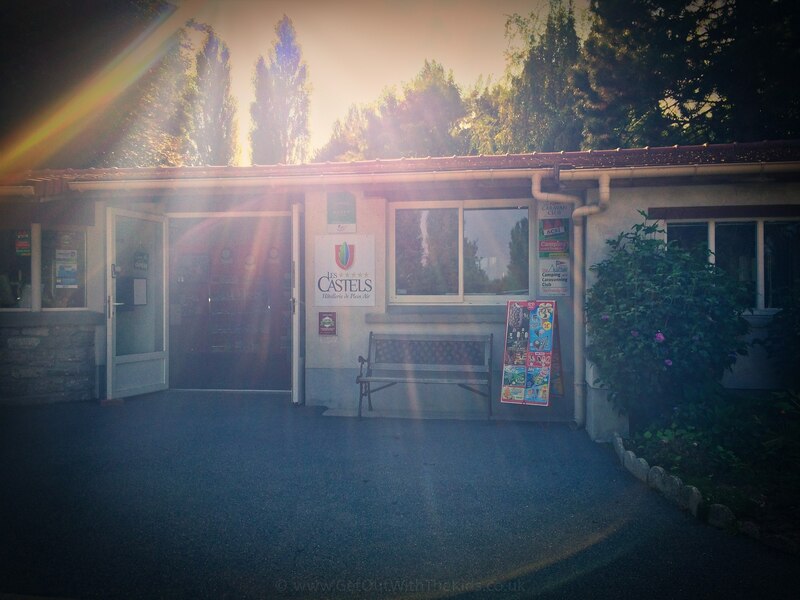 Oh, and of course, somewhere to buy French wine before returning home! I found it a little unnatural to drive on the left! After two weeks of driving across Europe, I found it a little unnatural to drive on the left! This is not the first time this has happened to me, but since I’m in a right-hand drive car, I didn’t think that returning to the left-hand side of the road would appear so strange. It’s a long way from the Channel Tunnel to our house, but after the 10 hours driving the previous days, the journey home didn’t feel so bad! Yes, but with some major changes. Two weeks wasn’t long enough. There were so many places we missed on our journey south, plus the days were too long driving. The kids did amazingly well with the long distances, but they were too long. If we could do this again, I think four weeks would be better, with many campsites in-between the ones we stayed at. Unfortunately, 4 weeks off work isn’t a reality for us and most parents. But despite the long journeys, we are so pleased we did the trip. It was an amazing adventure. Austria is on our list as somewhere to go back and explore more of! This trip has really inspired us as we’re also looking at Austria and Italy. We’ve got 3 weeks this August with a 5 and 1 year old. We’re taking our Outwell atc and hoping the trip isn’t too much doing a few pitch ups and pack ups. Three weeks is better than the two we did it in. Just be mindful of the distance. You might want to break the trip up with a few overnight stays. Mind you, if you aren’t towing a trailer, you’ll be able to travel a lot quicker than we did!